About a month ago I received the Milestone Pod for review. 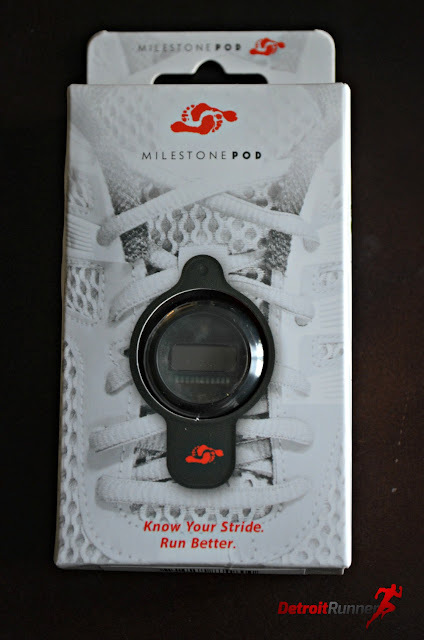 The Milestone Pod is a tool to help you keep track of miles on your shoes. It's quite a simple little product. 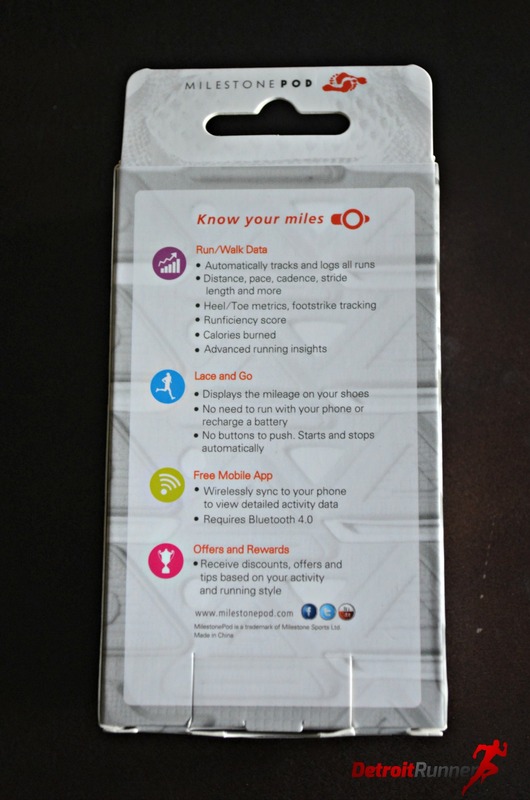 You take the pod and put a battery in it, attach it to your shoe and then sync you phone to keep track of your miles. If you are like me, I always forget to write my miles down. Of course, I can always go back and look on my Garmin to see what I ran but that is such a pain. Usually, I include them in my daily calendar so I know when to get new shoes. This device goes on your shoe and you don't even notice it's on there. When you first get it, you do a quick update to the pod to get it ready to run with. As you can see, you can see the miles also on the pod as well as on your iPhone with a quick push of the pod and it will light up briefly. 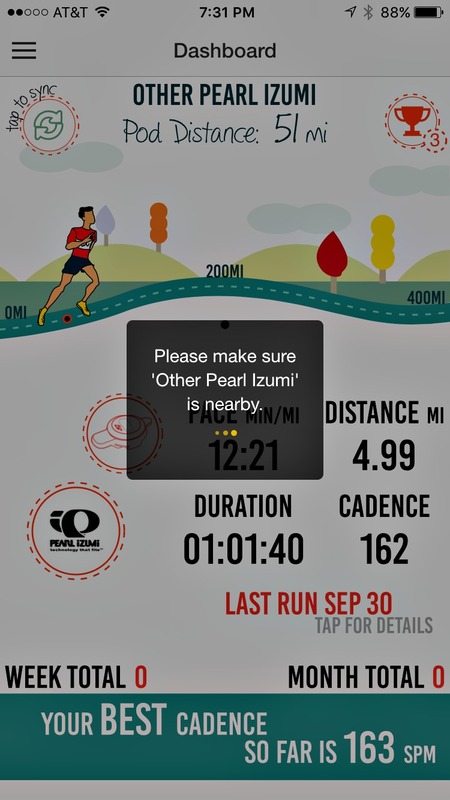 After your run, tap the sync button and it will add your run to the Milestone Pod log. 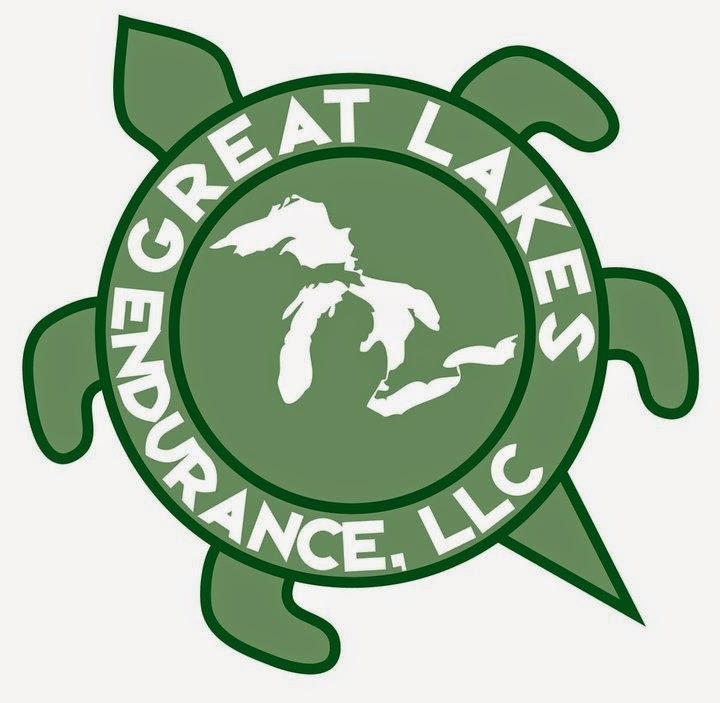 The log shows your pace, time of running, distance and cadence. It also shows the number of miles you have done per month. As you can see, the log keeps track of all runs so you can go back and look at them. For these four runs, I logged the following on my Garmin. While they are different from the Milestone Pod, I "calibrated" the first run on September 16th to get it exactly what my watch said so that it would become more accurate as Milestone Pod recommends. As you can see, the pod appears to be off from my Garmin subsequently by about 0.4 miles for each run. Perhaps I needed to keep calibrating it but I figure it's not something that should have to be done each run otherwise, there's no point to the product. I would also like to note that when I run with my running buddy, I'm usually about 0.2 miles further than him as well based on his watch. Given that, it's likely the Milestone Pod is not off as much as shown plus I can't say that my Garmin is not perfect either. All of these runs were done in the woods which does have an effect on the GPS watch. Overall, for tracking shoes, no matter what source is correct, the difference is only about 1-2 miles per week so still fairly reasonable. Well, reasonable at least for tracking mileage on your shoes. It is nice that the Milestone Pod will show other details of your run including time you started, length of time, calories, steps, pace and footstrike. In addition, it features cadence which I presume is fairly accurate given it's on your shoe. It also shows your stance time (although I'm not sure what use it is for me), and rate of impact. The rate of impact is showing 100% low but, I did notice on another run, I was 100% high and running on cement so that also appears to be accurate. The pod also measures your average stride length. Mine being about 31 inches I would believe is short because I tend to shorten my stride while running on the trails. It also calculates your leg swing and your overall efficiency. Each time you sync, you can see the battery level of the pod and the last time you synced it. You will notice that my shoe type shows "other Pearl Izumi" because they didn't have a list for the N2 trail shoes I was wearing. In addition to the iPhone sync, you can get an email sent to you with details about how to help you improve things. In this case, I had emails sent regarding cadence. 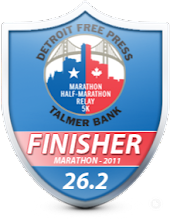 As you run more, you are rewarded with new awards to help you save money as well. It certainly is better than just receiving a little digital award. Overall, I like the concept of the pod in your help to keep track of miles on your shoes. You can reset it and move it to another pair of shoes once those shoes are retired but the company suggests you get one for each pair of shoes that you run in and keep track of them all that way. 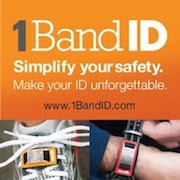 While the device sells for $25 each, I'm not sure it's worth the money to buy one of these for every shoe. I wear at least five pairs of shoes! 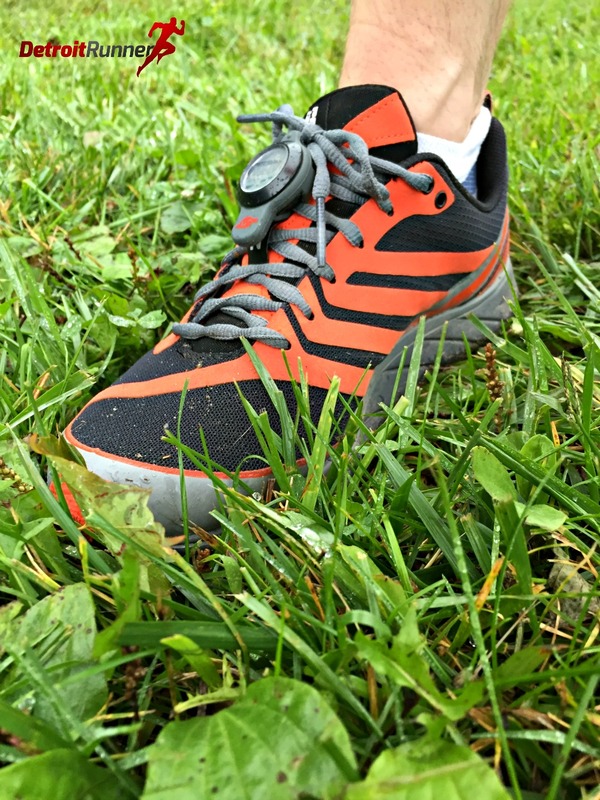 My biggest suggestion for the Milestone Pod is to offer something that allows you to move it from shoe to shoe and sync the shoe you are wearing. If you are like me, it will save you from buying one of these for every pair. It seems this could be accomplished fairly easy by making some kind of clip in order to make it easier to switch to your shoes. I really cannot see buying it for every shoe. If you are interested in learning more, you can order them online at the Milestone Pod website for $24.95. Disclosure: I received a complimentary Milestone Pod in exchange for this review. All opinions are my own and I was not required to give a particular opinion other than an honest one. I would use it for a road pair of shoes and aim at hitting the numbers. Does it also sync to other phones? It will link to any phone with blue tooth. You just have to download the Milestone app.